"I thank my God in all my remembrance of you." When I read today’s scripture, it immediately brought to my heart sweet memories of my dad and my brother. They have both passed on to heaven so all I have of them today are my memories of life with them. You may have experienced something similar, remembering someone no longer in your life. Our verse today is found in the opening of the Apostle Paul’s letter to the church at Philippi. This church help a special place in Paul’s heart because it was the first church he founded in Europe. The meaning in Paul’s words is clear: when he thinks of the church and its members, he is thankful to God. And he says further in the next verse that praying for them brings him joy. Some scriptures we need to dive deep to extract God’s rich meaning, but today it is right there floating on top. Now, that doesn’t mean it’s light weight or shallow. Oh, no. It’s like a beautiful water lily – in full bloom on the surface of calm waters but anchored down deep in the rich soil below the water. 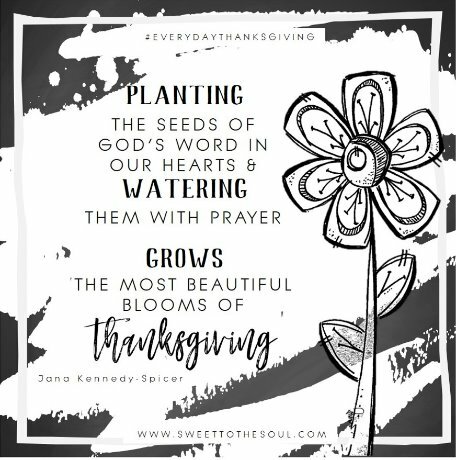 And that’s how I want this Word of God to be in my life – planted soul deep and creating beautiful blooms in my everyday life. For us to thank God, for anything, we must first realize that all things – EVERY thing – we have is from God. We can be so selfish, living our lives in a manner where we see everything and everyone revolving around us. Everything is here for me and everything is mine. That sounds harsh, but we are selfish at heart because of our sin nature. It’s not something we’re taught; we are born with this nature. No? Try taking that toy or blanket or bottle away from a baby! Ha! If we are blessed to have things and people in our lives, these have been given to us my Him also. That job or promotion that we work hard to achieve, it is a gift from God. That house or car or meal or brand name something or other that we just purchased with “my” money, yes, those also are gifts from God. If everything I have is indeed not mine but God’s, why do I not thank Him? And if everything I have is not something I have earned or deserve, but is a gift from God, why do I not thank Him? ​I have so many wonderful memories that I love to recall and would go back and visit some of those times or people if I could. But then there’s another room in my memory warehouse that I don’t like to visit. As beautiful as some memories are, others can be equally not. In Paul’s context, though, he is wanting to encourage the recipients of his letter. He is telling them that he not only remembers them, but that every time he does, he thanks God for them. How would you feel if that was the opening line of a letter you received? Ok, maybe an email, but all the same, to have someone stop whatever they are doing and take time to tell you that not only are they thinking about you but they are thankful for you. Add the bonus of them thanking God for you because they recognize that you and your relationship are a gift from God? When was the last time I made someone’s day in this manner? No, let’s go back farther. When was the last time I thanked God for the people in my life? And not just the ones who I am happy with or who have done something for me lately. When was the last time I thanked God for the difficult, disagreeable sandpaper people in my life? ​This is soul deep, friends. This is where the seeds are planted. If we truly desire for God to treat the epidemic of ingratitude and entitlement, we must allow Him to do this heart surgery in us. I must allow Him to cut straight to the heart of the problem – in my own heart – and plant the seeds of His Word deep – soul deep. 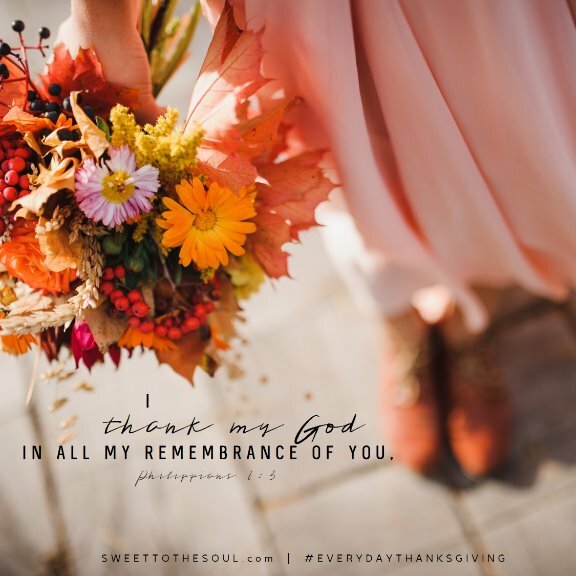 I’ve told God that I didn’t want to just make another cute little list focusing on the obvious wonderful things in my life, I wanted this time with Him to go deeper – and friends, He is taking me there. So, here’s my challenge for today – LIVE IT. What value is a “Thank You” if it’s never spoken? Jana, this is good. I needed this. I love your tern "sandpaper people" -- those folks who wear us out are the very same people who take the sharp edges off us, who make us kinder, gentler, more like Him. Writing a thank you note to those people, that's taking it to a whole new level. Thank you for that challenge.